Brownstones on Seaver Street in Roxbury, near Egleston Square. Apartment buildings such as these, as well as commercial buildings, were built along trolley lines as trolleys were extended further from the city. Same Seaver Street location in 1955. Trolley was later eliminated to widen the street for cars. As I say in Streetcar Tracks, "the construction of streetcar lines contributed significantly to the growth of the city of Boston." With trolleys frequently shuttling Bostonians from downtown to Boston's surrounding residential neighborhoods and suburbs, people could now conveniently live outside of the city's commercial center and commute to work via trolley. Beforehand, the most convenient way to get around was to walk or take a horsecar. The range of a horsecar was limited because of its source of propulsion, live horses. Imagine walking around the city all day, nonstop! Sound exhausting? It sure was for horses. Once electric trolleys came along, Boston had extreme development potential. Areas far from downtown that had once been populated exclusively by wealthy landowners, such as Dorchester, Mattapan and Roxbury, could now be developed and repurposed as plebeian housing districts. Accordingly, the Dorchester-Mattapan-Roxbury region changed dramatically following the construction of streetcar lines. Triple-decker apartment buildings and commercial shops were quickly constructed on former estates, and soon the region took the appearance it retains today of an urban neighborhood. Dorchester's Wellington Hill, for example, was once an estate. In the early 1900s, Wellington Holbrook, the heir to the estate, decided to redevelop the land into an urban residential neighborhood. Within a few years, Wellington Hill became the bustling residential neighborhood it is today. 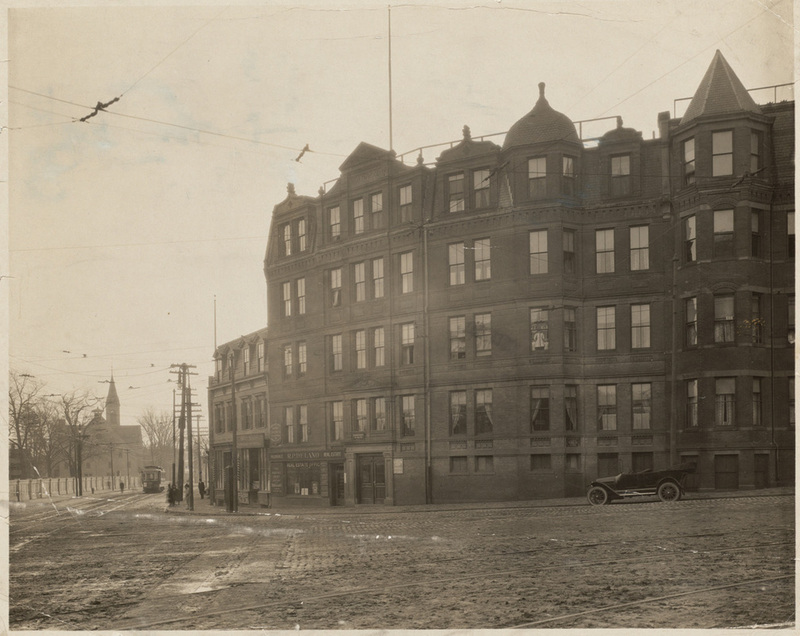 Apartments and shops in still-developing Uphams Corner, Dorchester around 1920. Note how the buildings are constructed with trolley access in mind. Also note the lone automobile; within a few years, the Ford Model T would hit production and fuel development even further from downtown. The 1906 extension of streetcar trackage from Grove Hall in Dorchester south along Blue Hill Avenue to Mattapan Square significantly influenced Hollbrook's subsequent development of his hill. With streetcar access, people could now afford to live in Wellington Hill and make the six-mile commute to downtown every day. Beforehand, a six-mile commute would have been completely impractical! Different, isn't it? 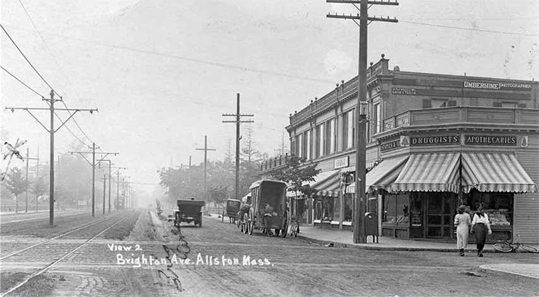 Now that streetcars brought Bostonians out to Brighton, people could come shop and live there, thereby allowing the area to grow significantly. 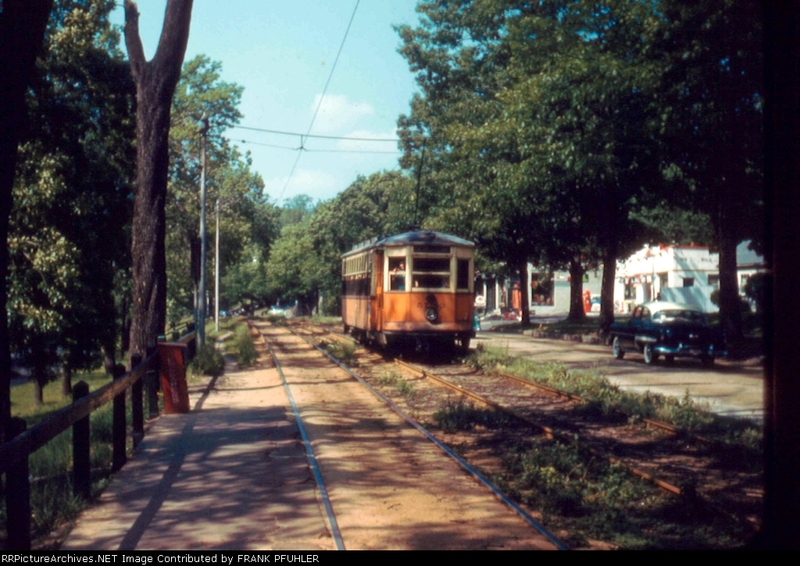 Accordingly, Brighton and other primarily residential neighborhoods in and around Boston whose development was fueled by trolleys gained the affectionate title "streetcar suburbs." It is important to note that within a there are "streetcar suburbs," such as Brighton, Dorchester and Jamaica Plain, that are parts of the city of Boston, whereas others, such as Somerville and Brookline, are separate municipalities. Trolleys fostered a sense of adventure in Bostonians. With trolley lines extending from the Tremont Street Subway downtown all the way to various surrounding suburbs, suddenly Bostonians were no longer confined to the city. For a single nickel, Bostonians could get from Boston to Newton, Stoneham, Dedham and other tranquil suburban neighborhoods via streetcar. Accordingly, many "trolley parks," essentially attractions with convenient streetcar access, were constructed in such suburbs. Now that land further from the city was affordably and conveniently accessible, new park ventures that could not physically fit in the city proper were installed and enjoyed by numerous Bostonians in search of respite from the bustle of the city. The Franklin Park Zoo, for one, opened five miles from downtown in Dorchester in 1912. The new zoo was conveniently located on the renowned 29-Seaver Street/Blue Hill Avenue streetcar line. Bostonians could conveniently catch the 29 at Egleston Square by taking either the old "El" or a streetcar to Egleston Station. Numerous other streetcar lines served the zoo as well. Type 5 Streetcars in front of the Franklin Park Zoo and since-closed Franklin Park Theater in 1949. Image Courtesy City of Boston Archives. Three miles away from Park Street Station downtown, South Boston's City Point was another popular destination for Bostonians easily accessible by trolley. Until 1953, one could catch the 9 streetcar in the subway and take that through the Pleasant Street Portal to City Point. Numerous other trolleys, most of which exist as buses today, ran to City Point from other transit hubs, such as South Station and Dudley Station. 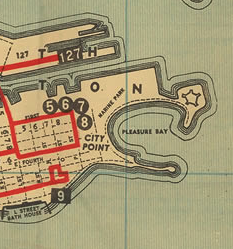 1938 BERy map showing four streetcar routes (5, 6, 7 & 8) and one bus (9) serving City Point. At City Point, one could bathe and swim in the ocean by Pleasure Bay or simply stroll along and enjoy the ocean breeze. Visitors to City Point around 1930. Note the large crowds—BERy would often park multiple streetcars nearby on nice days to accommodate everybody! Images Courtesy Boston Public Library. Another seaside Boston destination easily accessible by BERy streetcars was Revere Beach. 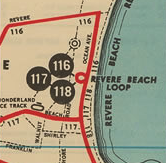 1948 MTA map showing the three streetcar routes that ran to Revere Beach. Three trolley routes, all of which originated from Maverick Station on today's Blue Line, ran to the Revere Beach Loop. 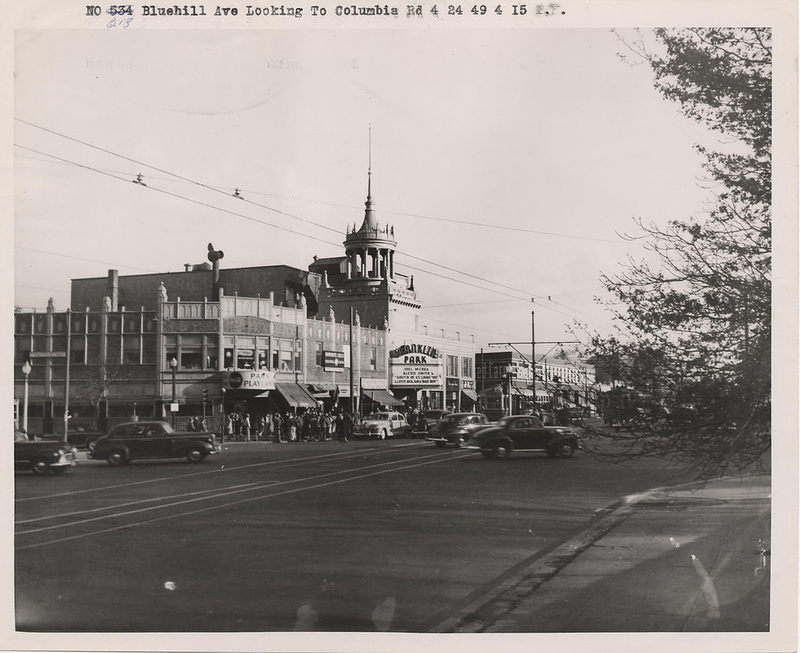 In addition to ocean access, what made Revere Beach a destination was its amusements. Ferris wheels, roller coasters and multiple other thrilling rides lined the Revere Beach boardwalk. One could also find indoor attractions, such as bowling alleys and ballrooms, as well as multiple food stands. Slideshow of scenes from Revere Beach from around 1930. Note the expansive crowds and the multiple amusements that lined the boardwalk. Images Courtesy Boston Public Library. While they are gone today, the amusements Revere Beach once hosted significantly increased the beach's appeal as a "trolley park." While the nine mile ride trek to the beach from downtown seemed long, trolley access made it easy for the typical Bostonian to visit the beach. And of course, the trip would be worth the wile once one reached the beach and the countless opportunities for enjoyment it offered. Stoneham's Stone Zoo was also built as a trolley park, conveniently accessible by the noble Fellsway streetcar Line that opened in 1909 and remained operational until the mid-1950s. The Fellsway Line began in Sullvian Square, providing a convenient transfer from the old Orange Line Charlestown Elevated, and ran along the Fellsway all the way up to the zoo and to nearby Spot Pond. Between hiking, swimming or boating at the pond and seeing exotic animals at the zoo, the Fellsway Line offered Bostonians a convenient gateway to great country fun requiring only an hour or so-long ride from downtown! Fellsway Line near the end of the route in Stoneham in 1955. Similarly, the 36 streetcar, which ran to the Charles River Loop in West Roxbury, serviced the outer banks of the Charles River, where one could swim or boat. This line was easily accessible by taking the E Line to its old terminus at Arborway, or any of the other lines that once terminated there. At Arborway, one could switch to the 36 and ride it all the way to the riverbanks. Charles River Loop, built specially for streetcars to turn around. Note the cafe, whose architecture is characteristic of the waiting rooms built at the terminuses of old streetcar lines. In addition to the last five attractions, all served by the Boston Elevated Railway's (precursor to MTA and today's MBTA) streetcar lines, many other attractions were accessible via streetcars of streetcar companies that operated further from the city. One could take a BERy streetcar, such as the line that ran to Chestnut Hill along Route 9 or today's B Line, to the last stop then transfer to a streetcar operated by another company to get to a far out country attraction. The Boston and Worcester Street Railway's Route 9 streetcar, which ran past BERy's limits in Chestnut Hill all the way to Worcester, served multiple lakes and rivers one could boat or hike along, such as the outer Charles River in Newton or Lake Cochituate in Wayland. Taking the B Line to its terminus at Boston College would bring one to the beginning of the Boston and Middlesex Street Railway's Commonwealth Avenue trolley. Yes, a trolley once ran along Commonwealth Avenue in Newton. That's why the grassy reservation on the side on the road is so wide; it was once a streetcar reservation. Commonwealth Avenue in Newton. Note the width of the grassy reservation; two tracks for eastbound and westbound streetcars once ran along it. 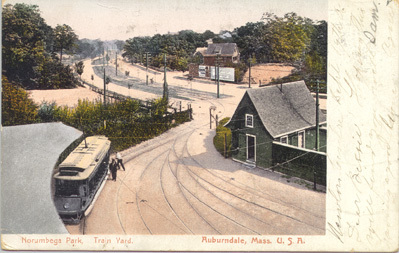 The Commonwealth Avenue line once ran all the way to where the Avenue hits the Charles River in Newton's Auburndale neighborhood, where an amusement park called Norumbega Park was located. In addition to swimming and canoeing in the river, here one could find rides, a theater, an arcade, restaurants and multiple other attractions. While Norumbega Park closed down in the early 1960s, another old trolley amusement park remains operational to this day. Canobie Lake Park, a popular destination among Boston-area youth, opened in 1902 as a trolley park easily accessible from Northern cities such as Lowell and Nashua, NH. Bostonians could get to the park by taking a BERy trolley up north, transferring to the Eastern Massachusetts Street Railway and then transferring to the Massachusetts Northeastern Street Railway, which would bring one to Salem, NH and to Canobie Lake Park.